Save $200 thru May 13th | Register Now! The Best Three Months: End of Life Certificate program begins with a 3-day, on-site workshop occurring September 26-28, 2019. The on-site training supports students via transformational, experiential practices that strengthen authentic presence and loving kindness, restores innate healing gifts and talents, renews purpose, and restores the art of caregiving to a spiritual path. This training and the interactive life changing activities provided by Tarron Estes increases one’s capacity to be emotionally and spiritually supportive during this vulnerable and, sometimes turbulent, period of life. The certificate course gives students the confidence they need to befriend death and to inquire about, and deeply connect with, what people want most during critical illness and death. Over the 3 months following the on-site training event, students take part in a virtual practicum called “Best Three Months: End of Life Coaching and Care”. 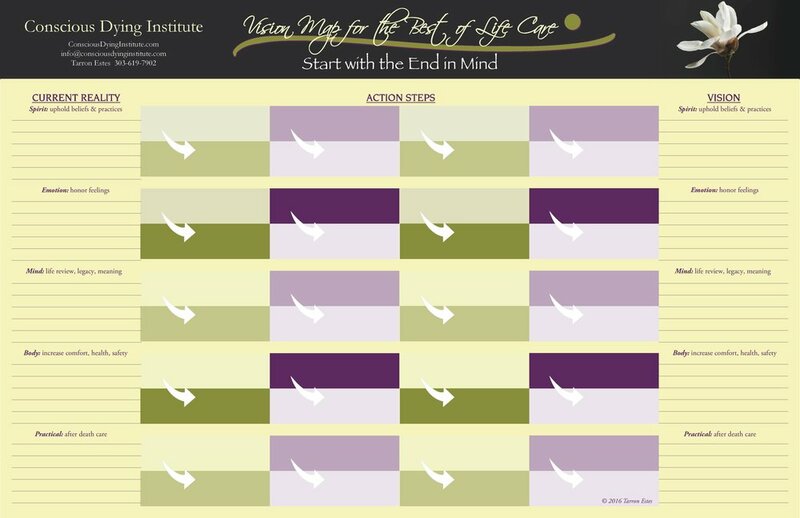 They work with student partners and community individuals to learn how to identify, understand, and implement end-of life-priorities in 5 domains of life. In this way, participants learn about what matters most to themselves, as well as to patients and their families, within the context of a “3 months to live” timeline. They engage with readings, resources, and reflective activities from the field of Caring Science as Sacred Science and Conscious Dying Healing Care. Together we can restore death to its sacred place in the beauty, mystery, and celebration of life, thus joining a culture of End of Life Coaches whose caring, healing presence and inner transformation awaken human consciousness. Create a New Praxis of Wisdom-Based End of Life Coaches and Educators who increase care and healing moments for patients and families and bring End-of-Life Education to systems and the public. By going through the "Best Three Months" practicum, students establish a strong foundation to foster integration of the 10 Conscious Dying Principles from Tarron Estes. It gives students an opportunity to synthesize all they have learned in this course so that as graduates, they can increase the number of people who receive the end-of-life care that they want and need, no matter the setting. Our End of Life Coaches learn the "Best Three Months" coaching model in preparation to listen deeply and implement the things people hold most precious in their hearts and minds. Program Cost: $1595.00 for 3-day, on-site training & Virtual "Best Three Months: End of Life Coaching and Care" practicum.